People who admire Victorian style jewelry will find Jaime Byrd's designs an innovative and fresh approach to Victorian replica jewelry. LoveToKnow had the pleasure of interviewing jewelry designer Jaime Byrd of Byrd Designs. 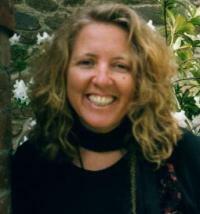 Jaime Byrd is an award-winning jewelry designer whose work has been featured in films and art fairs around the country. 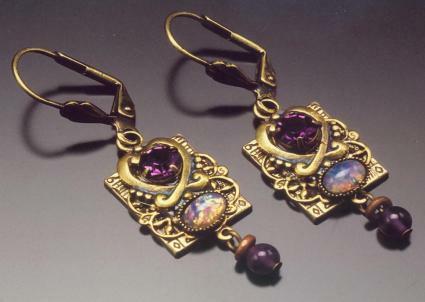 She creates both Victorian reproduction and modern jewelry in a distinctive brass paired with gemstones. Jaime carefully selects many of her jewelry findings and gemstones during her trips around the world. Her international travel inspired her modern jewelry collection at Around the World gems. In addition to jewelry design, Jaime is also a fine artist, film maker and musician. Jaime Byrd began as a musician and artist who made jewelry for herself as a part of her own creative expression. Yet, she soon found that many people were interested in Victorian style jewelry, especially her artistic vision of it, which led to an unexpected career. LoveToKnow (LTK): When did you first start designing jewelry?Jaime Byrd: I first started making jewelry when I was 15 years old. I think I was always drawn to making things with my hands from very early on starting with jewelry and clothing. My great grandmother made a lot of our clothes as kids and after learning first hand from her, I started making my own skirts and dresses by the time I was in junior high school. It wasn't long before I was finding beads and learning how to bend wire into earrings and necklaces! LTK: Were you always interested in jewelry? Jaime Byrd: No. I went to school to study music and theater. But while I was in college, I starting taking more fine art classes which resulted in leaning about pottery and metal smithing for jewelry. LTK: How did Byrd Designs begin? Jaime Byrd: Byrd Designs began as an accident. I always wanted to be creative and most of my life I was working as a musician or actor. I had made some barrettes for my own hair and the next thing I knew all my friends wanted me to make barrettes for their hair! It wasn't long before I sold my first wholesale order to a local gift store and suddenly Byrd Designs was born. It has been going strong now for over 16 years. LTK: What led to specializing in Victorian and Edwardian jewelry?Jaime Byrd: I think I've just always been attracted to that kind of stuff and the look. I love old stuff - all kinds of old stuff. I like the way some things age especially and metal is one of those things. I also just love the look of dated designs. They often have lines and structure so different from today's designs. LTK: What led to the creation of Around The World Gems? Jaime Byrd: I travel internationally every year to a new location on the globe where I can experience cultural exchange, exotic foods and new adventures every time. Because I love this experience so much and have such a strong interest in world cultures and ancient civilizations, it was quite natural to be drawn into the art and craft of other cultures jewelry and learn to take items from these countries and design with them myself. LTK: Byrd Designs is known for using quality brass in many jewelry pieces. Could you describe the brass? What other types of materials do you commonly work with?Jaime Byrd: The most common metal we work with is solid brass. This means it is free of nickel and other types of cheaper base metals. It will tarnish to that antique look easily and doesn't rust, turn green, or discolor your skin. Sometimes I work with silver, but I prefer overall working with brass because of its warmth and beauty. LTK: How do you get ideas for a new design? What inspires you to create jewelry? Walk us through your creative process.Jaime Byrd: I am inspired by color and nature in many ways. When I design, I think of things that have inspired me in nature and of course how colors are arranged next to one another. That is one of the reasons that I paint so many of my pieces. I love landscape paintings and there is nothing more interesting to me then fusing landscape with jewelry. It is lovely to me. LTK: In what ways does your fine arts background impact your jewelry designs? Jaime Byrd: I think it has a huge impact on my designing. Fine arts study is learning about design. Design is all around us. To understand design is to understand why something you love to look at, works for you. This education has translated to everything I do today - even my film making. LTK: Describe your favorite jewelry design and why. 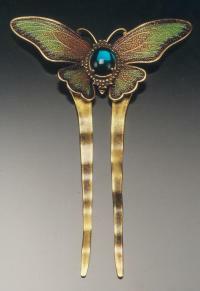 Jaime Byrd: I love the hand painted butterfly barrettes and combs like item numbers 2175, 914 and 9178. I take a lot of pleasure in blending colors to get the right shade and color to create a work of art. It's like painting on a canvas, but it is something that can be worn and that brings me great pleasure. LTK: What is your most popular jewelry design? Jaime Byrd: Probably my painted grape jewelry series. LTK: Which feature films used Byrd Designs jewelry? Jaime Byrd: The most visual use of our jewelry was used in the Irish film, "Nora" - the story of James Joyce's wife. LTK: Do you frequently participate in art shows? Which ones? Jaime Byrd: We now do only 3 shows a year. We participate in a local show here close to our home in Asheville, NC, called The Biltmore Village Art and Craft Show (August). We also do Yellow Daisy Art and Craft Show in Stone Mountain, GA (September) and The Pink Palace Art and Craft Show in Memphis, TN (October). LTK: What are the future plans for Byrd Designs and Around The World Gems? Jaime Byrd: I hope to keep creating beautiful pieces of art for others to enjoy! Visit the Byrd Designs websites for more information on Jaime Byrd and her jewelry designs. 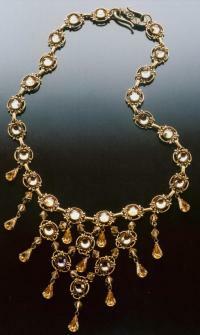 Customers can purchase Jaime Byrd's Victorian style jewelry at her website, Byrd Designs. Jaime's modern international jewelry styles are available at her website, Around the World Gems. Both websites have information on Jaime's artistic vision for both Victorian inspired and modern jewelry creations. LoveToKnow thanks Jaime Byrd for sharing her creative vision in the interview and wishes her the best in all future endeavors.